Aberrant N-methyl-d-aspartate receptor (NMDAR) function has been implicated in the pathophysiology of schizophrenia. Hydrogen sulfide (H2S) is an endogenous gasotransmitter that regulates NMDAR function. The current study investigated the relationship between plasma H2S levels and both psychopathological and cognitive symptoms in schizophrenia. Forty-one patients with schizophrenia and 40 healthy control subjects were recruited in present study. Schizophrenic symptomatology was assessed using the Positive and Negative Syndrome Scale (PANSS). Cognitive function was evaluated with a neuropsychological battery including seven neurocognitive tests. Plasma H2S levels were measured by reversed-phase high-performance liquid chromatography (RP-HPLC). Patients with schizophrenia performed worse in all of the cognitive tests than the healthy controls except for the visual memory. Plasma H2S levels were significantly lower in patients with schizophrenia relative to healthy control subjects (F = 3.821, p = 0.007). Correlation analysis revealed a significant negative correlation between the H2S levels and the PANSS general scores (r = − 0.413, p = 0.007). Additionally, a positive association was observed between plasma H2S levels and working memory (r = 0.416, p = 0.007), visual memory (r = 0.363, p = 0.020), or executive function (r = 0.344, p = 0.028) in patients. Partial correlation analysis showed that the correlations between the H2S levels and the PANSS general scores, working memory, visual memory, or executive function were still significant when controlling for age, gender, years of education, BMI, duration of illness, and age of onset. 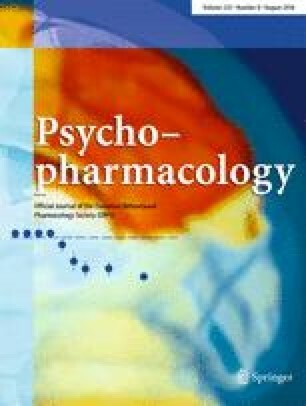 The significant relations observed in the current study between H2S and the general psychopathological as well as cognitive symptoms suggest that decreased H2S is involved in the psychopathology and cognitive deficits of schizophrenia, and it might be a promising peripheral biomarker of schizophrenia. Jian-wen Xiong, Bo Wei and Yan-kun Li contributed equally to this work. Jian-wen Xiong, Bo Wei, Yan-kun Li, Shu-zhen Jiang, Jin-qiong Zhan, Hai-bo Chen, and Kun Yan were responsible for the clinical data collection and lab experiments. Yuan-jian Yang and Bin Yu were responsible for the study design, statistical analysis, and manuscript preparation. All authors have contributed to and have approved the final manuscript. This study was supported by grants from the National Natural Science Foundation of China (No. 81560232, 81600939 and 81760254), the Natural Science Foundation of Jiangxi Province of China (No. 20151BBG70110 and 20161BAB205193), and the Natural Science Foundation of Hubei Province of China (No. 2014CFB186).